Mental health problems are very common – but nearly nine out of ten people who have them say they face stigma and discrimination, which makes life even more difficult. We originally wrote this post to celebrate “Time to Talk Day“, run by the charity Time to Change, who are working hard to encourage us to talk about mental health, and share our stories. As At LoveKnitting we hear time and time again how knitting can help with mental health problems – read on to find out why…. 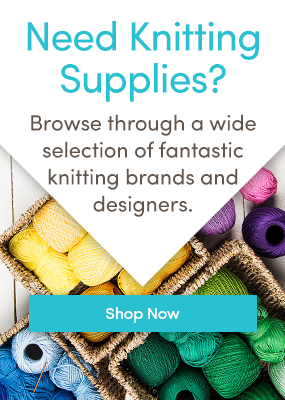 Not only are there some truly inspirational personal stories and quotes on the Stitchlinks website but details too about the research that has been carried out to study the health benefits of knitting. I have found knitting to be very therapeutic and took to it while studying occupational therapy to help with my own depression and anxiety. It helps me to calm and focus my mind on something. I’m not one for meditation, so I see knitting as a form of mindfulness, concentrating on the here and now, the next stitch or row. That’s brilliant Dani, I’m pleased for you. I’ve knitted from age six. I used to love knitting Aran. After three deaths in my family in a week I suffered depression and anxiety apart from diabetes. I struggled to knit again, but found I couldn’t knit Aran anymore – too complicated! So I set myself the target of concentrating and succeeding, which I did, thankfully. Knitting gave me a purpose. Also it gave me the opportunity of recalling happier memories. I learned how to knit in Kindergarten in Germany,and always found some time to make hand-knitted Items; i have volunteered in a Hospital craft group,producing baby outfits to be sold to benefit the community. Now all alone in my “Golden Years” I find time to make baby jackets and bonnets to give to mothers needing a little help. Happy to still be able to use my talent this way – to keep my mind busy and never be idle. Thank the sister who gave me the first instructions as a child. A good way to stay healthy also. I learnt from my beautiful mum some 42 odd years ago. I have lost count of the number of garments and toys produced. I knitted for my own babies and now my grandson. When I nursed my mum through her final stages of cancer knitting helped me to turn my head off . After she passed I fell into a deeper depression and was medicated for several years until I returned to the gym lots of walking and once again my knitting. Keeping my hands busy concentrating on patterns stitches counting rows does not allow my head to run away with itself . I now sell a little through a baby shop . Premie hats and blankets . As soon as I finish one item I can’t wait to start the next. The best thing is you can take ur craft on holidays . It’s fun to pick up new patterns and find new wools . Just pack a range of needles . I wholeheartedly agree with everyone here. 6 years ago I was diagnosed with a small melanoma on my arm. Within a year it had spread to my lymph nodes. I had them removed and 6 weeks of radiation. I recently celebrated 5 years cancer free and my love of crochet and yarn helped me through what was the darkest point in my life. My husband suggested I start selling my creations. Whilst doing yesterday I discovered loveknitting and I was hooked. I’m about to turn 52 and my beautiful nan taught me to crochet when I was 12. I wish she was still alive so I could show her what she taught me to do has turned into a life long love. I completely empathise, Carolyn. I too, learned to knit by being taught by my own beautiful mum and used it as therapy while nursing her through the final stages of cancer. I knit for hours by her bedside, giggling at memories while we chatted. I treasure those memories of the intimacy of being there at the bedside with her. All the medical professionals who visited were surprised by the contented, happy atmosphere as we knitted. She knitted right up until a month before her death. To us, it’s a family legacy. My daughters all knit and I run a knitting club, teaching children to knit for charity. Knitting is a gift. I have knitted since I was about 6 or 7 – I have always found it to be very theraputic – one time when I was out of work for about a year, I knitted every day all day and it definitely helped me to stay grounded – I am now 68 and still enjoy my knitting so much – it gives me more than I could ever have hoped for. I tolk up knitting again 10 years ago, when I had a MS attack that had a bad effect on my legs – knitted day and night for a week to prove to myself, that even though I was temporarily unable to use my legs my hands were still working – result a sweater that I still love wearing. now a days it is mental therapy to de-stress after work and keep mind sane and not thinking too much about the MS.
I’ve been knitting off and on since I was 8; I was diagnosed with severe depression when I was 19. I find it not only helps with my depression (I have taught it to people with depression and after accidents), but also with my dyslexia. With the depression, you can see the creativity, but it’s one of the only crafts you CAN rip apart and then start again if you need to. With the dyslexia, I’ve got real issues with sequencing, so you’d think I’d avoid lace and raised patterns like the plague. Hellz no! I’m like “bring it”. Still can’t get a hang of crochet though. Patterns might as well be Mandarin Chinese! I often reflect on just what makes me run to knitting when I’m feeling unbalanced or otherwise anxious. To simplify, I would say that knitting has always given me a satisfying repetitive-motion activity (akin to tap-tap-tapping my fingers or heels) but with a productive outcome. It also consistently reinforces in me a sense that, yes, I really DO have control of something in my life, even when it seems that I have no control over events. And, as mentioned, the opportunity to literally play with color is always a boost. It’s no wonder that crafts are beneficial to the mentally ill and to those of us who are not quite so easily labelled! Hi! I’ve been writing a book about knitting and the therapeutic benefits – it will be published in June. It includes some patterns written in a very straightforward way that even beginner knitters will be able to follow and also some slightly more complicated ones. Most will revolve around a square – which most people can knit – but there are differences to the usual knitted square. Knitting has seen me through two fairly major operations, relationship and family issues and times of isolation. I have also set up knitting groups to gather people together – it’s a great things to do when you’re chatting! About 4 years ago I went through a pretty nasty time dealing with Depression and Anxiety. Lots of things had gone wrong all at once including within 1 week I lost my job and was diagnosed as a young adult with T2 Diabetes which was heartbreaking. I started to feel a deep need to create something. I have no talent as a painter/artist but figured I could probably Knit. YouTube has been fantastic as a resource to learn stitches when I came across a new one in a pattern. It even has step by step tutorials on how to make whole items which I found invaluable to a newbie knitter. I had such a sense of accomplishment when I finished my first piece. It wasn’t perfect but I had actually succeeded in something, which in my depression I didn’t feel I could achieve anymore. I’ve moved onto Crochet now and I’m loving it! My friends and family are loving the things that I make especially for them and I am able spread joy and happiness! I honestly feel it was an integral part of my journey, along with support from family and friends and a good Councillor/Psychologist, that knitting and crochet got me through my depression to a place where I can deal with life again. I was rather pleased to see this article and took solace myself in learning to crochet (which awakened my interest in knitting) at the end of last year, since then I have gone from strength to creation of many projects. My health has declined over the last few years with not one but two autoimmune disorders and I suffer with depression and frustration at my physical lack of ability I once took for granted. Finding needlework, crochet, knitting and sewing, has given me new hobbies and interests and producing something has given me immense pleasure and a sense of achievement. There’s nothing like it. Thanks loveknitting too for being there to supply lots of lovely wool direct to my door. I have been knitting, crocheting and sewing for more than 40 years, I have frequent hospitalizations and my knitting always goes with me. I suffer from chronic pain, diabetes and asthma. I knit for my family and currently for my Grandchildren. Due to a back problem I can’t sit at the sewing machine for long but knit constantly with the odd crochet thrown in. I find it is my life line especially when in hospital, I have just had 3 weeks in and in that time knitted a shawl, 2 pairs of socks for myself and a cardigan for my Granddaughter I am know as the knitting lady by all the staff and they can’t wait to see what I am knitting. Knitting just doesn’t pass the time but keeps my sanity as well. My grandma taught me to knit from about 6 years old. I would sit next to her while she knitted, armed with the same size needle and the same wool as her, and she would teach me the stitch she was doing. I have knitted ever since these early days but in the past 6 years, since I moved to the country and joined a knitting group, I have discovered the great joys of belonging. I no longer knit in isolation and other people, who share my passion, are interested in my creations. I look forward to our meetings and try harder to achieve my goals as I know that this group of knitters will be happy and supportive of my achievements. Now, if I am unsure of a pattern, or need some advice, I don’t have to sit alone and wonder if I’m doing it right or if there is another way. If I’m worried about anything or feeling anxious, I know that knitting will take me into a world where my arthritis doesn’t exist and my thoughts become calm and all my worries just don’t seem important any more. And knitting does even more than the above! All the science is compiled on the knitting site CognitiveAnchoring dot com. Lovely site you’ve got here! I wrote an article on my blog about knitting (or crafting) and mindfulness a few weeks ago. I believe that knitting (or any other kind of simple repetitive craft) is crucial especially for busy mamas out there, looking after children, running a household, always planning, doing, multitasking. To be quite frank, knitting keeps me sane and gives me that little simplified me-time that I need for myself. I used to get frustrated by how little time I had for knitting and how long it took me to finish a garment. But when I realised that knitting is not a speed or quantity competition I started to really enjoy the process. I truly realised what it meant that ‘the destination is the journey’. And so now I just really try to focus on every single stitch and enjoy it as much as possible. After all, what does it matter whether I take one or three months to make a cardigan? The main thing is that I enjoy it! I used to knit avidly years ago but when I was diagnosed with Parkinson’s disease two years ago decided to take it up again as therapy. It’s not only wonderful as a control for my hand tremor but also as a mood lifter. It became even more useful when my daughter moved to Tanzania and started voluntary work at a children’s orphanage as I’ve now got a tangible purpose to knit garments for the little ones. I have been knitting since I was 5years old, I am now 52. I have always loved it and found it relaxing. I have suffered with depression since I lost my daughter 15years ago but recently had a total mental breakdown. I hadn’t knitted or crocheted anything for a long time but picked up my needles on the advise of my therapist and found it was one of the best therapies to take my muddled thoughts away. I would recommend it to anyone suffering with mental health problems. I learnt to knit from mum at quite a young age but for me it didn’t ‘grow’ quick enough. My grandma showed me how to crochet and I love it. I taught my children how to knit, the boys as well as the girls! Only my younger daughter was interested in crochet. She is now a serious crocheter. Knitting increases finger manipulation, posture, strengthens neck, upper back muscles, and arms. It provides an education in a new skill, and a sense of being productive. It also offers a means to calm our senses as previously referenced. It also lulls the knitter in reflection of deeds passed. It has been shown to benefit PTSD sufferers. Men were the first knitters (well at least began with fishing nets). Encourage veterans to knit or spin or weave. Time well spent. It encourages reflection on life. Has anyone heard of any benefit of knitting for dementia or alzheimer’s sufferers? At a recent consultation at the National in London I was wearing a jumper I had knitted using Rowan wool. We then spent a large part of the consultation talking about the various benefits of this craft for those who are unfortunately suffering from Alzheimer’s/Dementia and ended up sharing pictures on our phone of various projects. Not only did this shared interest calm my anxiety during the consultation but it has stopped for ever my husband complaining about my stash all over the house and the fact I am constantly clicking away!